Five days’ International Forum jointly organized by Towards Organic Asia (TOA), the Green Market Network, Suan Nguen Mee Ma social enterprise, Organic Agriculture Innovation Network and School for Wellbeing Studies and Research with: URGENCI, the global network of CSA initiatives and the International Federation of Organic Agriculture Movements (IFOAM), together with partner organizations, including the Asia Today initiative of Maejo University, Chiang Mai, the oldest agricultural institution in Thailand. In association with the 6th annual Green Fair “community organic”, organized by Suan Nguen Mee Ma social enterprise; and the Organic and Natural Expo 2013 + Organic Symposium of the Ministry of Commerce, Thailand. As an Asian contribution to the 40st anniversary of IFOAM (International Federation of Organic Agriculture Movements), celebrated at the IFOAM Headquarters in Bonn, Germany, November 2012, the Thai Green Market Network and Suan Nguen Mee Ma social enterprise, in response to the “IFOAM birthday wishlist”, cordially facilitate together with partners a global meeting of the IFOAM PGS Committee at Chulalongkorn University, Bangkok. The meeting is arranged to coincide with a gathering of the newly formed URGENCI Asia group. URGENCI is the network of CSA initiatives, the most direct approach to farmers’ – consumers’ partnerships. 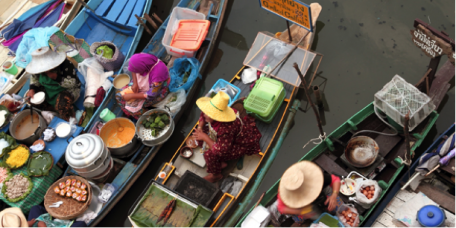 The aim of the International Forum on Innovating Alternative Markets,Bangkok, 7 – 12 May 2013, is to create markets for small-scale “organic” (or: “in transition to” organic) farmers by connecting them directly with mindful consumers, and their organizations. In order to bringing the food economy home, a special role is perceived for social enterprises who help facilitate building partnerships based on Participatory Guarantee Systems (PGS). This effort revitalizes the grassroots origin of IFOAM which was founded in 1972 in Versailles, France, at the initiative of Nature et Progrès, the organization that at that time already promoted and practiced “PGS”, and does so until today. Participatory Guarantee Systems place the responsibility for quality support and control in the common hands of the diversity of stakeholders involved, in contrast to “third party” certification systems, which incur high costs that cannot be met by small-scale farmers. The registration for this forum is free of charge. Please fill in the registration form (available at the end of page) and send to rita.innovationforum@gmail.com. For further inquiry, please contact rita.innovationforum@gmail.com. Welcome Dinner with IFOAM PGS Committee, URGENCI the global network of community supported agriculture (CSA) initiatives, La Via Campesina, Towards Organic Asia (TOA), partner organizations and International Forum participants. Registration, introductions and preview of the forum. Meeting with representatives from international alternative movements for agro-ecology; URGENCI, La Via Campesina and TOA to exchange on the future prospect for connecting local actions for global changes. Shaping Community Supported Agricultur initiatives in your own cultural context. With Joy Daniel, the new URGENCI Asia network, Etona Orito, Teikei Japan, Jane and Payong Srithong, CSA Bangkok and partners. Asia Today academic network on action-research platform; preview of international conference at Maejo University, Chiang Mai, December 2013 (continues in the evening). Joint exchange and planning meeting with all partners and the global Committee on Participatory Guarantee Systems (PGS) of the International Federation of Organic Agriculture Network. Report and discussion on the previous 2-day meeting of the committee at Chulalongkorn University. Representative practitioners from the four region of Thailand shares their experience and lesson-learned on PGS in local contexts. Joint meeting and statements on the future of “agroecology” by partner organizations: IFOAM PGS Committee, URGENCI Asia, La Via Campesina, TOA, Asia Today and others. Exchanges with the media and dinner. Day 1 – Friday 10 May 09.00-17.00 hours, hosted by Ministry of Commerce. Morning in Thai with translation in English; Afternoon workshops in Thai. Day 2 – Saturday 11 May 09.00-18.00 hours hosted by Green Market Network and Towards Organic Asia programme. In English with Thai translation; World Café with Thai language groups. La Via Campesina delegation including from Indonesia, Japan, Thailand. Exchange and discussion on how to move forward the “green market” movement in Thailand? Andre is the current President of International Federation of Organic Agriculture Movements (IFOAM). He has over 36 years of experience in all areas of organic agriculture from growing, pest control, weed management, marketing, post harvest, transport, grower organizations, developing new crops and education in Australia and in many other countries. He supports strengthening the Participatory Guarantee Systems (PGS) approach in order to include small-scale farmers in the organic and agro-ecology movements. Pablo is the new Executive Director of Focus on the Global South, an international NGO with offices in Thailand, Philippines and India. Pablo was the former Bolivian Ambassador to the United Nations. As ambassador to the UN, he became known as a tireless advocate for the rights of Nature; he delivered the now famous speech explaining why Bolivia chose to “stand alone” by not signing the Cancun climate agreement in 2010. Pablo is a social activist involved in indigenous “buen vivir” movements, workers’ unions, student associations, human rights and cultural organizations in his native Bolivia. He created Climate Space at the World Social Forum. Eva works as an independent consultant and PhD researcher to provide support to different emerging PGS initiatives in Spain and neighboring countries. Eva also maintains strong linkages with the French PGS Nature & Progrès. Eva manages a small subsistence organic farm in Andalusia, Spain. She is a member of the World Board of IFOAM. Chris is an organic horticulturist and managing director of Bioglobal Consultancy. In 2001-2003, Bioglobal developed “Organic Farm New Zealand”, the national PGS system in New Zealand. Chris is still involved in OFNZ as a certification manager. Chris is also a PGS trainer for IFOAM with experience in Africa, India, South-Asia and the Pacific. Alice has been involved with PGS since 2006 when she became executive director of Certified Naturally Grown (CNG). Alice’s background in grassroots organizations has helped her to expand CNG’s membership and operations. In 2010, CNG launched an apiary certification program. Mathew has worked with the Keystone Foundation in India for the past decade. Keystone has been working in the Nilgiri Biosphere Reserve (NBR) over the last 17 years (since 1985) with indigenous communities on eco-development initiatives. Mathew is a member of the PGS Organic India Council, which he helped to set-up in 2006. At present he is the only member of the IFOAM World Board from Asia. Janet is PGS advisor of the National Association of Ecological producers in Peru (ANPE) and is a member of the Peruvian national PGS. Janet has been involved in the development of ANPE’s PGS from the start (2005). Marc has been practically and academically involved in smallholder ‘natural’ and organic farming for the past seven years. He is currently working as a PGS consultant for the Bryanston Natural and Organic Market in Johannesburg, South Africa. In addition, he is completing his MPhil degree on urban and peri-urban agriculture. Joy is the Executive Director at IIRD – the Institute for Integrated Rural Development. Since 1987, IIRD has been exploring into the area of “self-reliant” development through people’s initiatives focusing on organic agriculture, alternative marketing, appropriate housing, micro-enterprise development, community- based health, environmental education and women’s development in the region of Marathwada in Maharashtra. Joy studied at the Asian Institute of Technology, Thailand, and was a Knowledge Management Advisor of UNDP. He is Asia Coordinator of URGENCI, the global network of CSA initiatives. Etona Orito is currently a Ph.D. student at the University of Tokyo, majoring in Environmental Ethics and Agricultural Philosophy. Her research field is the Japanese organic movement, with an interest in the history of Teikei as well as the system and the relationship between producers and consumers. She also has experience engaging in her own organic farming for a while after taking one year of training at the Shimosato Farm in Saitama prefecture in Japan in 2003 which is one of the leading Teikei organizing farms. Teikei is a pioneering member of URGENCI.